Честно сказать, очень впечатляющие картинки. Так бы хотелось там побывать. Наташа, спасибо за фотографии с Денни, они замечательные. Ого! Счастливчик тот, кто смог ее приобрести, там полно сюрпризов! Международная Ассоциация музыкальных критиков (IFMCA) назвала сегодня своих победителей. В их числе, в номинации Лучший архивный релиз - box-set, записанный к двадцатипятилетию творчества Тима Бертона и Дэнни Элфмана. Издание включает в себя книгу в твердом переплете плюс 16 компакт дисков с 18-тью часами музыки и беседы между Денни и Тимом. Предисловие к книге написал Джонни Депп. Денни, как и любому иному, вроде Тима и Джонни, "оскары" не светят, и такие награды - это очень важно! Запись музыки для фильма была сделана в последние недели постпродукции "Мрачных теней". "Я слышал, что Мрачные Тени должны выйти в мае. Мой друг только что снимал оркестр, играющий саундтрек для фильма!" Интересно, почему настолько поздно? Я думаю, что Тим принял решение о музыкальных фрагментах, когда фильм уже полностью был сделан. -Что изначально сделало из вас с Тимом идеальных сотрудников, и как ваши взаимоотношения развивались на протяжении всех лет? Володя, ответы на вопросы не прячутся от нас вовсе, поверь! Вот здесь Денни Элфман --- Danny Elfman пост Slo номер 168, ссылка на интервью Денни "Тим Бертон открыл передо мной все двери". Если посмотреть на дату выкладывания самого интервью, можно понять, что это ноябрь 2010 года. В следующих постах ниже я, а затем Люба (Mrs LOVEtt) выложили две части перевода большого интервью. - Что ты заметил, работая с Джонни Деппом на протяжении лет, в личностном и профессиональном плане? Денни: «Забавно наблюдать за ростом Джонни Деппа. Он развил красивый, богатый голос, которого у него не было. Он был как ребенок в «Гилберте Грейпе» 19 лет назад, но он развил богатство своего творческого голоса. Такого обычно просто не бывает. Его голос в роли Барнабаса и его голос с роли Суини Тодда – это на самом деле красивый голос». - Что у тебя и Джонни Деппа общего? «Он воровал фотки гитар из моих дорожных чемоданов. Когда «Оинго-Боинго» репетировали, мы снимали место для репетиций, а они снимали комнату там же. Они взламывали замок и они крали струны и фотки гитар из моих чемоданов. Он мне признался позже». 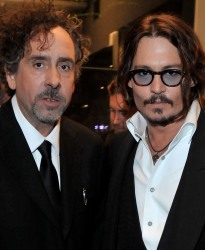 What have you noticed working with Johnny Depp over the years personally and professionally? It’s fun watching Johnny Depp grow. He’s developed a beautiful, rich voice that he didn’t have. He sounded like a kid in Gilbert Grape, that was 19 years ago, but he developed this richness of his voice. It doesn’t just happen. His voice as Barnabas and his voice in Sweeney Todd, it’s really a beautiful voice. What do you and Johnny Depp have in common? He used to steal guitar pics from my road cases. When Oingo Boingo was rehearsing, we hired out a rehearsal space and they used to rent a room, his band, in the same space. They were broke and they would steal strings and pics from my cases. He confessed to me later. Денни Элфман о "Мрачных тенях"
"Был короткий период, в котором мы были в разводе, но ни один из нас не был доволен разделением. Я не работал в его фильме ["Эд Вуд" 1994], и я чувствовал очень ужасно в связи с этим. Затем мы помирились и были вместе с тех пор. Не нуждаясь в парной терапии"
"Мы не говорим о том, какой должна быть музыка тогда, когда все только начинается. Иногда он говорит мне: я хочу чтобы людям было грустно в этой сцене. Или - мы должны подчеркнуть. Но обычно мы ничего не говорим". Как и Тим, Денни чувствовал себя иным в детском возрасте. "Мы выросли в среде, к которой не принадлежали. Я всегда чувствовал, что я человек из 19 столетия, живущий в 20 веке"
Денни говорит о том, как в детстве ему доставалось из за его рыжих волос. "Все, что я хотел, это чтобы у меня были черные волосы, выглядеть, как Шон Коннери в роли Джеймса Бонда, но я выглядел как клоун. Это было очень печально". Денни говорит, что его бросает в озноб от мыли о возрождении "Оинго Боинго". "Некоторые группы возвращаются, но это не означает, что и мы должны. Если вы умерли, вы должны продолжать оставаться мертвым. 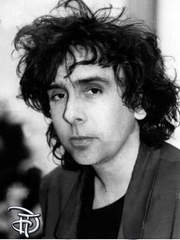 Мы должны быть зомби в подполье"
The composer wins the Billboard/Hollywood Reporter Maestro Award and talks about how working with Tim Burton has changed over the years ("his ears are sharper") and how the theme to "The Simpsons" took 10 minutes to write. Composer Danny Elfman has won a Grammy and an Emmy and earned four Oscar nominations with almost 80 film scores. On Oct. 25 at the W Hotel in Hollywood, THR film critic Todd McCarthy will present Elfman, 59, with the Billboard/Hollywood Reporter Maestro Award, previously won by Alan Menken, Thomas Newman, Hans Zimmer and Marvin Hamlisch. McCarthy will host a Q&A with Elfman and Sacha Gervasi, director of the Elfman-scored Hitchcock, due out in November. THR asked Elfman to reflect on his 27-year career and his biggest year, 2012. The Hollywood Reporter: How did you score seven films in about a year's time? Danny Elfman: Eight. Dark Shadows, Men in Black 3, Frankenweenie, Silver Linings Playbook, Promised Land, Hitchcock, Oz, Epic. I've never had a year like this. It's a blur. Ripping myself out of one and hurtling into another is like switching alternate universes, a ripping slash. THR: You're like the slashed-up Boy Scout on your band Oingo Boingo's Only a Lad album cover, marching on. How was Tim Burton different on Frankenweenie versus 1985's Pee-Wee's Big Adventure? Elfman: He's still the same Tim, much more opinionated now, with sharper ears. People think it must be easy by now, but that's not the case. It's still a big effort to find out what it is that's inside his subconscious. I don't have any kind of secret path. He doesn't want to analyze his films upfront: "This means this, this means that, this is how I feel about this moment." He's like, "Um, OK, here's the movie. We'll talk about it when you have something to play." Like David O. Russell, he's got to learn during the process what he responds to and why. He'll draw my attention to a few moments here and there where he has concerns, but it's very simple. Tim's spotting sessions [where the director and composer meet to decide where the music should go and how it should sound] are the shortest on the planet. Alice in Wonderland we spotted in less than two hours. THR: What was Russell like on Silver Linings Playbook? Elfman: I was apprehensive because I have a real fear of romantic comedy. It's the one genre I go out of my way to never do because I don't have a feel for it. I see very few comedies, even. But this was just strange enough, and I loved the chemistry between Bradley Cooper and Jennifer Lawrence. I thought it'd be easy, since there isn't that much music. It was far from easy, because David is such a character. He tortured me endlessly but never stopped amusing me. The trick with David is to be very patient, just kick back and try to enjoy the Russell Experience. Really worthwhile. THR: You imagined yourself into composer Bernard Herrmann's head for Gus Van Sant's Psycho remake. What was it like to score Hitchcock? Elfman: The main thing I wanted to know from Sacha was that he didn't want to do a Herrmann-esque score, a mock Psycho. The story is a romance between Alfred and Alma Hitchcock. It's a fairly romantic score, and it gets a little darker where Hitchcock is in the world of Ed Gein [the killer who inspired Psycho], talking to him. I found myself occasionally doing Herrmann-esque things, but not intentionally. He's so much part of my DNA, there's moments where yeah, there's a bit of an homage there, but it's just me. THR: Tom Stoppard said when people see Pirandello's influence in his first play, he feels like a smuggler's dupe: The contraband is in there, but he can't recall packing it. Elfman: Exactly. Bernard Herrmann is the reason I'm a composer. THR: Why did you do Promised Land? Was it fun because Van Sant likes to let people take big risks? Elfman: There's so many things fun about working with him, but that's an important one. He actually forces me to take risks. I start with ideas and he'll say, "Let's try completely opposite stuff and see what happens." I just start playing Gus pieces I'm writing. For Promised Land I'm thinking, "OK, guitars, a very simple Americana score." Gus was like, "Why don't we do the whole thing on marimbas?" He's just a pure pleasure to work with. 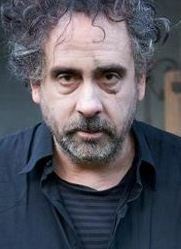 THR: Are you and Tim Burton both looking for something perverse? Is that what your imaginations have in common? Elfman: Yeah, it depends on the film. Frankenweenie is very much not perverse. The heart of the score is very sweet, where Dark Shadows is going to be a bit more perverse. THR: What makes music funny? THR: Do you have a "funny" button on your console? Elfman: I wish. On Oz just yesterday, I was playing some music for [director] Sam Raimi and he was laughing out loud. And what I did that was so funny in this particular moment was a pause. What's usually funny in music is timing. When I'm making Sam laugh effectively, which I've been doing quite a bit of this week, it's because I'm finding the timing of a scene, putting in accents and pauses in very specific moments. It's funny without trying to be. THR: Music is a combination of repetitive pattern and surprise, and sometimes the best sound is silence. Elfman: Absolutely correct. Where something starts or ends is a very big thing. There's a lot of music in Oz, about 115 minutes, but I'm having a great time because the music's all very narrative, and I really could go on almost a hypnotic trance and just pour music out in a way I really enjoy. I'm really telling the story with music, I've got a number of themes blocked out, and it's flowing really easily. THR: Maybe this work binge is good for you. When I asked cartoonist Gary Larson if he ever runs out of ideas, he said no, cartooning gives you "comedy muscles." Do you have composing muscles? Elfman: Believe me, I'm worried about fatigue, but far from it. I've actually suddenly found myself writing really aggressively and fast and not feeling tired at all. I have this joyful feeling of being toward the last laps of a big marathon and feeling very strong. But it's my constant plaguing worry that I'll run out of ideas. THR: Has your process changed? Elfman: It's exactly the same for 27 years. Like lowering a bucket into a well, and you have to wait until you hear the splash of water. Sometimes you're running out of rope and you go, "Holy f--, there's no water in this well." Eventually, I find water. THR: Is it easier to do a sequel? Elfman: Men in Black 3 was a pleasure, a vacation almost. There is this simple beauty in a sequel. I've got those characters and that style of how to tell it musically down so cold, it's like I'm stepping in fully loaded. Usually starting a film is like coming out of the Terminator bubble, when you've just gone in from the future and you have no clothes, no weapons, nothing. THR: Did rock critic/Simpsons auteur Matt Groening ever review your band? Elfman: He gave us a nasty review and I wrote a nasty rebuttal, because he admitted he only showed up for the encores, drunk. I reluctantly became a fan of his Life in Hell comic. It was like, "I hate this guy, but God, is he good." Twelve, 13, 14 years later, when I was leaving a great meeting on The Simpsons, he goes, "I don't know if you remember, but ... " We shook hands. I felt like The Simpsons theme should sound right out of 1965. I literally wrote it in the car on my way back home, recorded a demo in 10 minutes and sent it to them the same day. The most direct thing I've ever done. THR: Hitchcock writer Stephen Rebello told me you are "the impossible love child of Bernard Herrmann and Peter Lorre." Elfman: It could very well be. I'd like to think I'm the love child of Bernard Herrmann, but I would never be so presumptuous as to say so. The Peter Lorre part for sure. I always joke with Tim because his idol was Vincent Price and mine was Peter Lorre, and this defines our relationship: He's the tormentor and I'm this tortured Peter Lorre. There's a moment in The Beast With Five Fingers when the hand is crawling up Lorre's chest and he's trying to pull it away. That scene is closer to how I feel when I'm working than anything else. The piece I'm working on is that hand, and it's gonna kill me or I'm gonna try to kill it, but we're locked together in a reality there's no escape from. He nails it to a piece of wood and laughs because he's finally gotten it under control, but of course the next day it's come free and it's gone. The moments I feel in control of my own work are momentary and fragmented. - Как отличался Тим Бертон на «Франкенвини 2012» от Тима Бертона «Пи-Ви 1985»? ДЭ: Он все тот же Тим, но намного более самоуверенный, с чуткими ушами. Люди думают, что теперь должно быть легко, но это не тот случай. Это по-прежнему серьезные попытки найти, что нужно, внутри его подсознания. У меня нет никакого тайного способа. Он не желает анализировать его фильмы вот так: Это значит это, то значит то, а вот так я чувствую себя относительно этого момента…» Он просто: «Хм, окей. Вот фильм. Мы поговорим об этом, когда у тебя будет что сыграть». Как Девид Рассел, он научился в процессе понимать, за что он ответственен и почему. Он привлечет мое внимание к парочке моментов, которые его беспокоят, но это очень легкие задачи. Мои встречи режиссера и композитора с Тимом – самые короткие на планете. Для «Алисы в стране чудес» все наши встречи длились менее 2 часов. - Ты и Тим Бертон – вы оба ищете что-то извращенное? Это то, в чем ваши воображения схожи? ДЭ: Зависит от фильма. «Франвкенвини»не очень-то извращенный. Сердце истории очень нежное. В то время как «Мрачные тени» имеют немного извращенного. Четвертый календарный год нам на БертонЛенде доводится читать редкие интервью Денни, в 95 (или в 100?) процентах из которых он говорил вещи о Тиме в обиженном ключе. Это не только не стало исключением, но и стало одним из самых ярких примеров этого. Всякий раз, начиная с известных нам интервью о работе над "Алисой" в 2009 году ("Все, что я знаю о фильме, - зеленые экраны и Депп") Денни рассказывает о том, что Тим не хочет ничего ему объяснять, что они встречаются супермимолетно. Тон всякий раз предельно обиженный. В этом году Денни явил миру Деппа-воришку. Здесь он называет Тима самоуверенным в отнюдь не комплементарном ключе. Надо же я поражена, насколько Тим не контактирует с Денни. Я думала, что для написания такой потрясающей музыки Тим должен был рассказать Денни, что он хочет подчеркнуть в том или том моменте, рассказать ему детально свои ощущения или даже может быть некоторые метафоры, какие посчитает нужным. А оказывается, он с ним почти не проводит бесед вовсе. Значит, Денни полагается лишь на свой талант, чуткость, чувство стиля, умение прочувствовать сильные моменты фильма. Его талант очень велик, ведь он сам, на ощупь идет, получается! Это не только не стало исключением, но и стало одним из самых ярких примеров этого. «Когда я получил звонок о том, что я должен встретиться с Тимом Бертоном, я не знал, кто он. Я знал, кто такой Пи-Ви, Пол Рубенс, но я понятия не имел, почему они хотят, чтобы я встретился с Тимом Бертоном. Тим сказал: «Мы ищем саундтрек». Я спросил: «Почему я? !» Потом я пошел домой и сделал маленькие записи. Я записал демо и отправил на съемки в Санта-Монику, ожидая, что более ничего никогда от них не услышу. Но позже я получил звонок о том, что я получил работу, а мое демо стало заглавной композицией для «Большого Приключения Пи-Ви». «Моим самым тяжелым проектом с ним и в моей жизни вообще был «Бэтман». Никогда больше не было у меня такого опыта. Ни продюсеры, ни студия не желали меня в этом фильме. Теперь так не бывает». -Погоди секунду. Что значит «ты никогда не слушаешь то, что ты написал»? «Я никогда не слушал то, что я сделал. Как только саундтрек готов, фильм готов… Я делаю саундтрек до стадии финальных редакции – и затем всё отправлено. Я никогда не слушаю это больше. Никогда». «Из двадцати часов музыки примерно восемь – то, что никто никогда не слышал. Это странная, безумная хрень, которая не была в саундтреках, некие полуоформленные идеи, это что-то, что мгновенно улетело в другую вселенную». Black Veil Brides - поклонники Денни Элфмана и Тима Бертона. Про эту группу недавно говорил Элис Купер, в том ключе, что они - как его маленькие братишки. Речь шла о продолжателях традиции Купера на сцене в той или иной мере. Наши дружат с молодыми музыкантами. Тим приглашает их принять участие в своих фильмах, выступать на его мероприятиях, Джонни основал студию в Лондоне, чтобы оказывать поддержку начинающим. Его музыкальные вкусы, Огги Марч, Бебиберд, Шарль Трене, Nitty Gritty Dirt Band, Боб Дилан, Джим Моррисон и так далее, очень разнообразны. Нельзя сказать, что Джонни любит рок. Он любит хорошую музыку, которая вполне подходит под понимание - поп. Тот же Серж Гинсбур, что его музыка, как не поп? ПОПулярная музыка. - Вы писали музыку для всех фильмов Тима Бертона за одним исключением. Почему не случился «Эд Вуд» 1994 года? ДЭ: «Мы с Бертоном знакомы более двадцати лет, мы хорошие друзья. Такие длительные отношения с неизбежностью могут привести к большой стычке. Вдруг все начинает взрываться от гнева и напряженности, которая - оглядываясь назад, это становится понятнее – возникла у нас друг к другу. На «Кошмар Перед Рождеством» ушло более двух лет моей жизни. Между тем, для «Бэтман Возвращается» я также должен был написать музыку. Большое напряжение и много работы, и это привело к большой ссоре. Мы шутим между собой, что это был принцип Альфреда Хичкока и Бернарда Херрманна, с великими себя часто сравнивают. Они никогда не разговаривали потом друг с другом, и я также заявил тогда: "Я никогда больше не напишу ему музыку!" Через год я начал чувствовать себя очень плохо, и, как оказалось, он тоже. В течение почти двух лет мы не разговаривали. Это как когда ты ребенок кричит своему брату: "Я никогда, никогда не буду разговаривать больше с тобой!" Но все равно ведь рано или поздно он будет разговаривать с ним. Мы как семья были тогда, и когда мы снова оказались вместе, по его инициативе, мы разговаривали друг с другом, как и раньше. Нам пришлось начинать все заново».